← Kapoor & Sons: Absorbing, layered! There’s nothing as a dull day for someone who writes about films for a living. I wrote a diary about my ardency for the medium in 2002 and I feel exactly the same enthusiasm more than a decade later. Even at its most frivolous, cinema offers so much insight that it’s actually humbling. Furthermore, there’s always such hustle and bustle enveloping it. Be it releases, projects, trailers, events, hype, scandals or nostalgia and the hyperbolic response to anything and everything, it’s all ridiculously fun. I’d like to believe my life is slightly more exciting thanks to the movies and all the curious bits I come across in the line of duty. 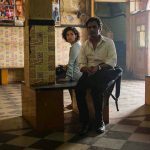 So here are titbits from my super filmi week, one I hope to share a lot more regularly with you. Monday is my least favourite day of the week; Monday Blues, you know? Wasn’t feeling upbeat until I stumbled upon a photograph of Ki & Ka’s leading man, Arjun Kapoor at the Golden Petals Awards red carpet. As he stood there, grinning widely in his sparkly tie and French beard, my inner Mungerilal struck. 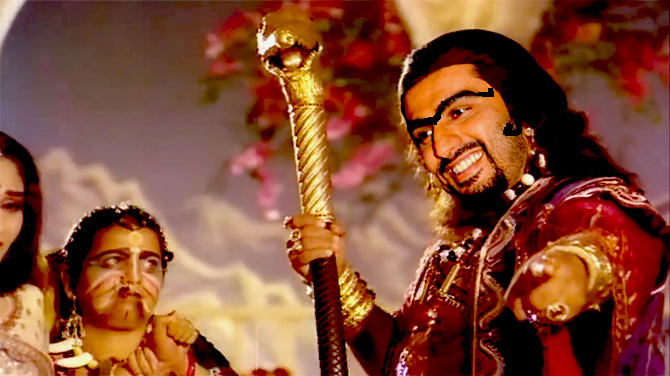 Is it just me or does Arjun bear uncanny resemblance to Kader Khan’s wicked wizard Mantrik in Pataal Bhairavi? My Photoshop skills are lacking but, you get the drift, he could totally do a Mantrik. All right, I’ll admit, this campy 1985 costume drama starring Jeetendra and Jaya Prada is a top guilty pleasure. How I wish some visionary would remake this trippy fantasy. If tapped, Pataal Bhairavi has enough sorcery, blood and darkness to craft something credible around a genre Bollywood shies from. Or how about simply Mantrik Origins, sounds rad no? What say, Arjun? A sleepy Dharmendra: Kaun hai tu? A snappish Praveen Kumar: Teri maut. Cue for hostile background score. The latter’s hoodlums begin to circle threateningly close around Dharmendra – camera zooms in on bald guy scratching his pate, tough guy rubbing his wrist and, oh well, you know how it goes? Back when Dharmendra sleepwalked through interchangeable action vehicles like Mard Ki Zubaan, Mardon Wali Baat, Khatron Ke Khiladi, Loha, Zalzala, Hukumat, Hum Se Na Takrana, Jaan Hatheli Pe, Aag Hi Aag, the ilk, this aforementioned run-in was an indispensible requirement. I tweet the same. I’ve struck a chord. The response is equally droll. Our celebrity chat shows are so terribly blah. Stars seldom open up or let their hair down unless baited by someone influential like Karan Johar or mega like Salman Khan. Reason for this rant is I discovered a segment called lip sync battles on The Tonight Show Starring Jimmy Fallon, wherein the host and his celebrity guest try to outclass each other lip-syncing one chartbuster after another by way of mannerisms and spectacle. Its success inspired an independent spin-off on Spike Cable Network. I found out about it shockingly late whilst hunting for an old interview on YouTube. As the old cliché goes — better late than never. Oh man, the episodes featuring Tom Cruise and Emma Stone are pure gold. If you haven’t watched it already, please do. 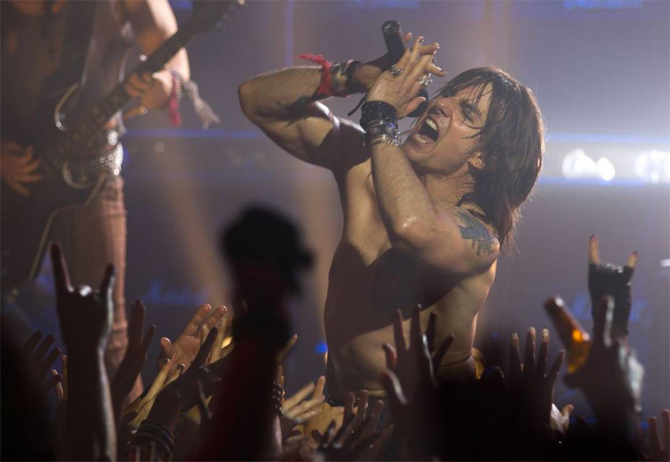 Given how smoothly he slipped into the skin of an 80s rock idol in Rock Of Ages, I wasn’t surprised but only too happy to witness the Mission Impossible star’s take on Meat Loaf’s Paradise By The Dashboard Light. It’s easy to see why he’s still so popular despite the relentless backlash. It’s a perfectly uneventful day until British tabloid Dailymail carries an item on Serbian tennis player Novak Djokovic and his “female companion” stepping out of a LA eatery. Only the “leggy brunette” turns out to be none other than Bollywood’s reigning queen Deepika Padukone. Regardless, it’s the third reaction I have a problem with — of humourless lowlifes predicting trouble in her love life because, let’s see, a woman in a committed relationship cannot break bread with another man unless it’s all over? Ugh. Thank God it’s Friday? Not really. I’ve spent the better part of the day reviewing and recovering from Himesh Reshammiya’s deadpan delivery in the awful Teraa Surroor. Later in the evening, Captain America: Civil War unleashes its fantastic new trailer that is big on spoilers but no one cares because there’s A) Black Panther and B) Spiderman and, what’s wrong with you, isn’t that enough? 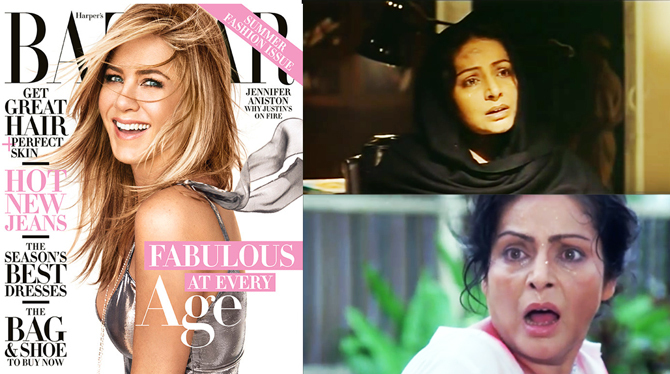 Another thing to catch my eye is Jennifer Aniston’s cover girl act on Harper Bazaar’s April issue. Could the 47-year-old be any hotter? At her age, Raakhee was playing mom to Shah Rukh Khan and Sanjay Dutt in Baazigar and Khalnayak respectively. The biggest news of the day is Malaika Arora and Arbaaz Khan’s alleged split. I only hope it’s not true; the possibility of love drying up is always so heart breaking. Having interviewed both of them at different points of time, my thoughts veer to all those sweet things they said about each other once. I met Arbaaz Khan at their Bandra home to discuss Garv in 2004. Back then here’s what he shared: We are a very normal couple with our share of issues and everything. We respect and love each other’s independence and identity. We share a great communication. We give each other a lot of room. We have been together through five years of courtship and five years of marriage. We share a great rapport and relationship. 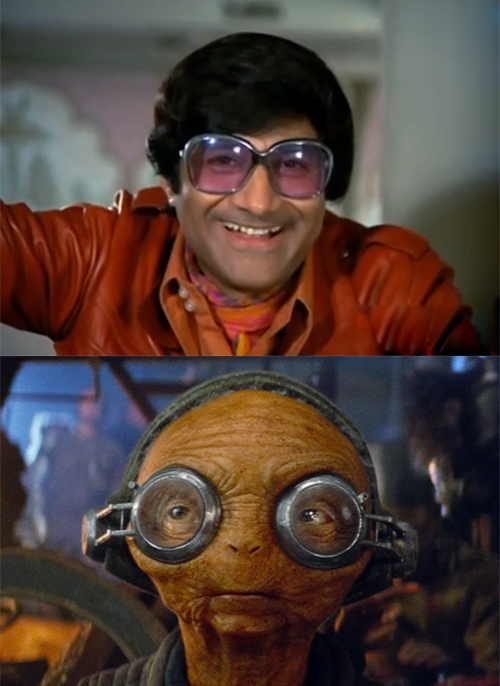 Between all the snoozing and arranging computer files in systematic folders, I found this fun picture I saved for my movie quiz – of a visibly pleased Dev Anand and his enormous Maz Kanata-reminiscent sunglasses. 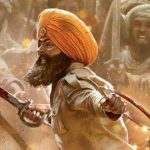 This entry was posted in Columns & Reviews and tagged arbaaz khan, arjun kapoor, bollywood, column, deepika padukone, dev anand, dharmendra, hindi films, jennifer aniston, jimmy fallon, kader khan, malaika arora, maz kanata, naakabandi, Novak Djokovic, pataal bhairavi, raakhee, rediff, sukanya verma, super filmi week, tom cruise, week at movies. Bookmark the permalink.